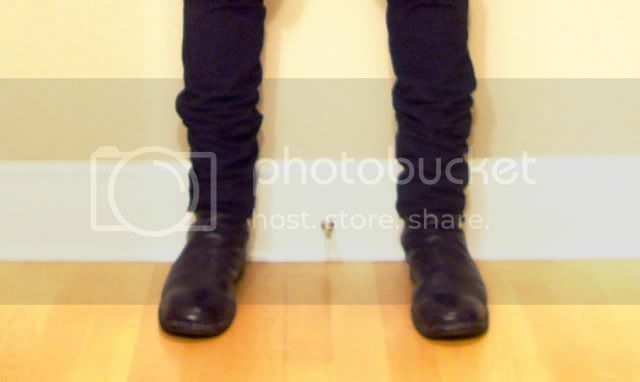 imo the typical guidi shaft is too narrow for tucking, but they are perfect for wearing trousers over them. Yes, I want to show off the back zip, at least partially. ^I think I saw you trying out the shoes at A yesterday. Did they have backzip in calf leather? I only saw the sidezip one's. I am not sure - these are the only backzips I saw. IF had a low pair in bull leather, which was (strangely enough) softer, but they didn't have my size. Are the current season's Guidis on 40% off as well at A? Is the overall shape of these different from the Donkey backzips? These look AMAZING, btw! To my knowledge no...if they were, I'd be posting some major recent purchases! I have the mid-height backzips in baby calf leather. Boots were the reason to become a member of SZ and SZ made me buy Guidis a few months ago. It is the most comfortable and versatile boot i've ever had. All the options described above work well although I prefer to tuck the pants in, no matter if slim oder wider. 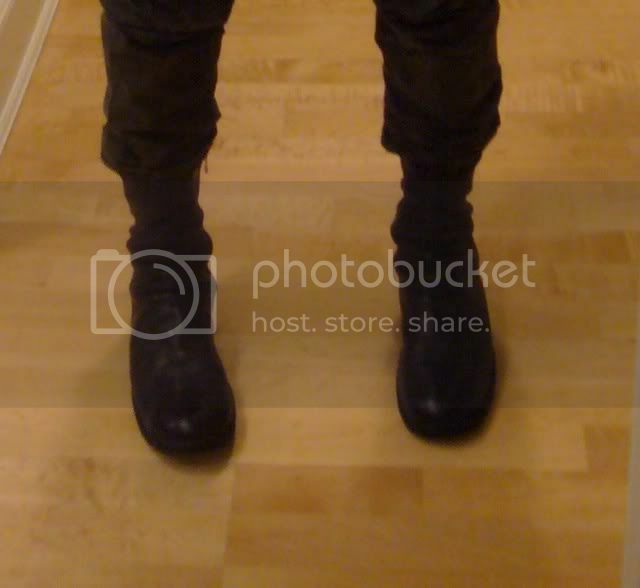 With the pants worn over them the boots can actually look rather smart. For the versatility you have to get the mid-height boots. The calf leather feels soft but robust at the same time. I'm about to invest in a pair of Guidis myself, and having not had them before, I'm not sure of sizing. 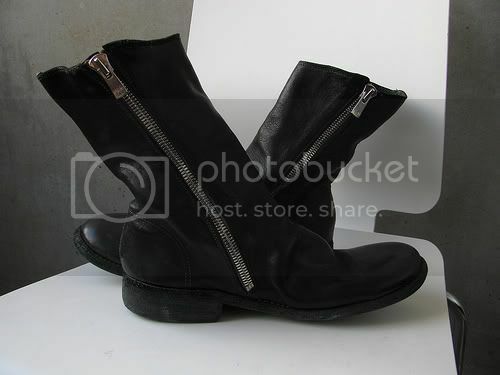 I know they run on the small side, which means as a size EU42 normally I would techically wear a Guidi EU43. Am I correct? Viceroy had to go to a Guidi EU44, so I'm a little confused. Could anyone please enlighten me on the situation? I had to size up two sizes for the backzips. Me too. I have size 42 and for the lenght of the boots I had to take a 44. The shape of the boot makes them rather loose around the foot, so that I wear them with inlay soles. I feel it depends on the style of the boots. Tried the mid-height backzips in size 42, and they fit snug, which is how they should fit. Tried the low-height (ankle-high) backzips (which I understood to be exclusive to Lift) in size 42, and while they fit ok, were not snug enough imo. Tried them in 41, and they were way too tight. Last edited by Acid, Bitter and Sad; 12-05-2009 at 09:29 PM. Definetely try them on. I wouldn't have believed anybody who told me I need a 44. Even when able to try them on, it is a bit of a leap of faith. I remember when I bought my lace-up boots they felt obscenely tight but the guy helping me in Japan assured me they would stretch within a day. "Promise?" "Yeah, sure." I seem to be a minority in that, no matter what style I have tried on, I have fit size 44 across the board (usually being a 42.5-43). I don't remember for certain the different leathers I have tried, but I have tried on probably nine or ten different pairs and the 44 has been perfect in all of them. In how many different heel-heights have the classic backzips been produced? Only two? As far as I know only two. But why only? You can choose between different leathers, colours, heights of the whole boot, heights of the heel, sidezips and backzips. AM1 in berlin have an online shop now, going to check out a few pairs soon.